I have been working on adopting an old PLC software to support Propeller. The concept is straight-forward: You draw the LADDER logic diagram in a GUI, switch to simulation mode and simulate your ladder program. When the simulation is done and you ladder works as expected, simply hit F12 and download the prop code into your demoboard! As you can set all the IO assignments for your ladder diagram, you can develop your own PLC (or use Parallax relay card, etc.) ! 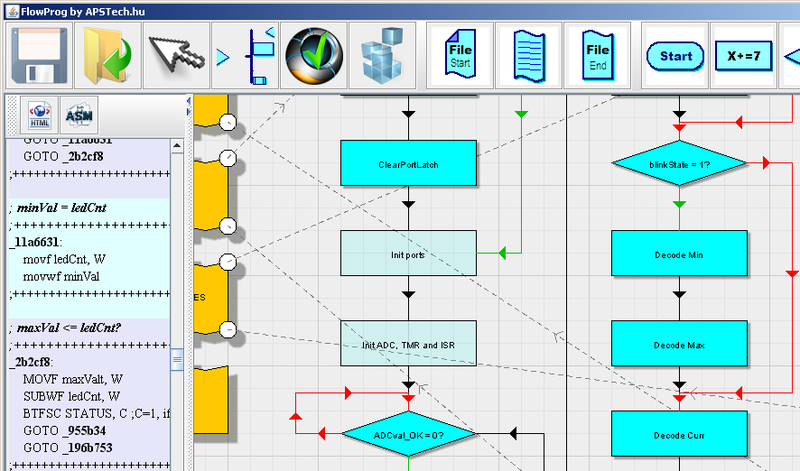 If you are an Assembler programmer, you could be interested in FlowProg as well. I'd like to take a look at FlowProg.· Could you supply a link to it please. This is great! i have been wondering, and was about to post the question, has anyone thought about ladder logic programming for the prop. i have worked in industrial maintenance for over 20 years and anyone that has knows the influence that ladder logic has in industrial machinery utilizing plc's as most are standardized to AB's and thier unrealistically high priced software. (although they do offer a free, chopped down version now, after many years). I think that a ladder logic based programming language coupled with the processing power of the prop is a perfect match for industrial use. as most maintenance and industrial engineers have over the years been forced to use and learn ladder logic in machine development, diagnosing and troubleshooting, we simply are comfortable with the concept of ladder logic and use in machinery control. A program like this, i believe, will open up the flood gates of embedded control designers and machine builders to lovingly adopt the Propeller (and the propeller 2 with the addition of onboard adc's) as a more affordable and more feature rich control enviroment for machine control! Thank you very much for this and i commend you on you developmet of this software! Keep up the great work and if you like, i would definatly love to beta test this for you in a prop and digital i/o board setting. Does this software have any analog functions or pid functions yet? Thank you for your words kf4ixm! The software software has analog functions, but not tested. I am sure, I will have time to implement if for Propeller by end of this year [noparse]:)[/noparse] PID will be implemented in summer. Good grief! This is great. While I prefer to program in Basic (no longer a valid name for such a rich language) VB6 & assembler I have spent years programming in Ladder so that people in an industrial environment can maintain and troubleshoot their process. Thanks for the effort creating this and I hope it takes off for you. Can you tell us what function blocks are implemented? Hey this is really insane, I was trying to do the same thing! by the way, did you used his interpretable bytecode generator to create the spin code? I was not able to run his source code on visual studio, how did you managed to get it work, with the perl scripts? Hi, You are absolutely right, Jonathan Westhues did the base, and I am not very happy that the current version on the web does not contains his name. The story behind is a bit complex, however I have also tracked down, that the original sourcecode was Jonathan's work. Anyway if you check out the upcoming release (the hungarian manual for it is already published, check pg 21-22) the well deserved credits will go to Jonathan Westhues. Answering the other question: No, I did not use the bytecode generator for SPIN . The internal software structure has been radically changed. Basically the GUI editor, and the simulator part remain the same as for LDmicro. Rename the .jar.zip to .jar and it should work. It worked! Thank you Circuitsoft! A simple renaming from .jar.zip to .jar fixed the problem! I've worked on the same project !!! Modified LDmicro to fit the propeller chip ! My version creates a SPIN file too !! at this time I can make any logic , use uart, and analog via a specific SPIN object (analog.spin) using an PCF8591 converter. Atilla, you're my double !!!! And yes, tanks to Jonathan Westhues who made his software free and give all the sources !!! Be careful of the word "proven". The responsibility for making sure this software works with Props and works reliably as expected is yours. Looks to me like it's discontinued or withdrawn for relaunch as a more comercial product or something to that effect. The links are dead and the site no longer seems to have any sign of PICoPLC for any chip.